One of the things I feel is challenging as a Western woman living in the Middle East is something so trivial as eyebrows. Yeah, maybe you where expecting me to say politics, cultural differences or even religion, but these parts have actually never provided me with any sense of unease. Eyebrows, on the other hand, they definitely do! The thing is, that for the Middle Eastern woman, maintaining immaculate eyebrows happens to be big business. Incredibly harsh, (in my opinion) dark and graphic eyebrows are popular over here and what may be perceived as beautifully painted eyebrows differs from the perception of how to do eyebrows in the Western world. Especially for me with a Scandinavian approach of less is more when it comes to beauty, I had never done my eyebrows by using 4 different products or tried microblading. I may have been living under a rock until I moved here; but I hadn’t used any other eyebrow products except for a CHANEL brow pen and landing in Dubai was a chock to the system hahaha. My brows where hiding of embarrassment somewhere in a dark corner. Whenever you see new eyebrow products launch I tend to get disappointed. The reason for that is that they are always used on a brow that is already thick, dark and full length with the perfect arch. Not much can go wrong by adding a product into the mix. My brows on the other hand are super thin, very sparse and oddly shaped. The hair grows in different direction between the two of them which makes them difficult to paint in by using a wet product, for example a brow mascara. I’ve tried brow products from almost every large brand available on the mid- to premium market and only two brands made the cut: MUFE and ABH. 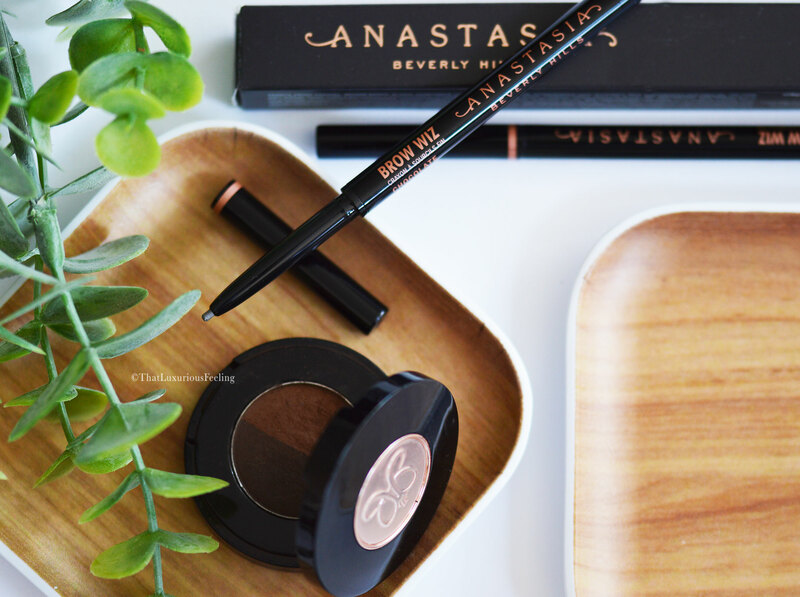 ABH – Anastasia Beverly Hills is by far my favourite when it comes to creating brows for all faces and tastes. Already back in 1997 when Anastasia Soare opened her first beauty salon in Beverly Hills, she quickly made a name for herself as the Queen of Brows. When her first product line launched in 2000 she was set to write company history. Taking her brand to what it is today: the number one authority of eyebrows in the world there is not much to say about it. Of course her products would suit even me and my brows. The Golden Ratio® Eyebrow Shaping method. By early on manage to calculate the ratio of a perfect brow for any face shape, the company is today quoted worldwide for the best way to paint on a brow. Haven’t we all heard about drawing a line from your outer nose wing, straight through your pupil and up to the brow to find the exact point for where the arch should be? All thanks to Anastasia Soares. The Tools. I’ve never encountered finer angled brushes from any other brand with the same quality to the bristles. I’ve had mine for five years and not one single bristle has dropped or wrinkled! The Pigment and shade range. Whatever product you personally opt for; pencils, powders or liquids, the range of shades suits ALL skintones and the pigment allows you to create everything from super natural looking brows up till the black, prominent brows that are popular over here. It’s all up to you! 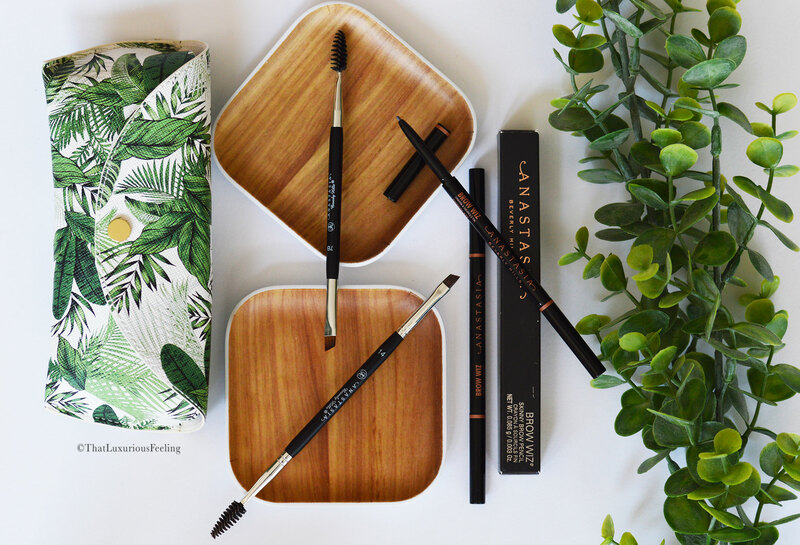 I thought I’d show you my ABH eyebrow essentials in hope that you’ll discover the brand and forever wave goodbye to sad looking eyebrows! On the picture above, you see a small, round compact palette. This is the Brow Powder Duo and it was my very first discovery from the brand. Available in eight shades (with each pot containing two complimentary shades from the same shade spectrum) you have a stunning sixteen colours to choose from, with both cold and warm undertones. I use the shade Chocolate and it was the first dark brown product I had ever tested that didn’t oxidise to orange or went ashy on me. I’ve written a previous review about the powder which is available to read over here. What makes the Brow Powder Duo such a winner in my book is the fact that it is sweat proof which is a must in out high humidity. As most of my “brows” have to be painted on carefully, it is my biggest fear that by mid-day, half of my brows are gone with the wind. I need a semi-permanent solution to get me through the day. This powder provides sheer-to-medium coverage but if I moist the brush slightly, I can easily achieve a full on, full size brow that still looks natural and fresh! The second reason why I choose this product over and over again is its skincare benefits. I have very flaky skin in my brows, I’m thinking it might even be a mild case of psoriasis. 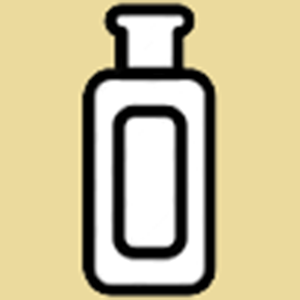 Anyhow, the powder contains important antioxidants in the form of Vitamin C and E both important nutrients to the skin. As I can’t add too much SPF onto my brows (the colour of my products will get compromised) I’d like to believe that the powder at least provide a little bit of shield to any environmental damages coming my way. 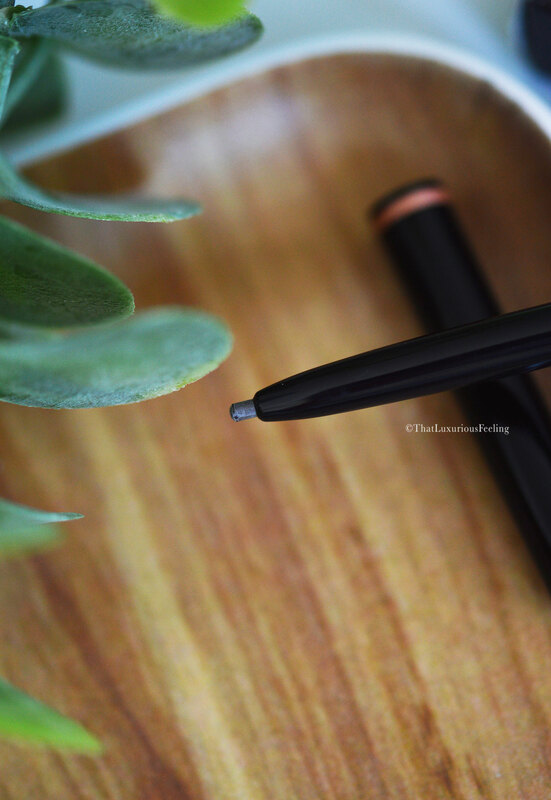 My second most repurchased product ever is the ABH Brow Wiz® brow pencil. This is incredible. With its never-seen-before-skinny nib it can easily mimic even the finest of hair. Cult Beauty describe it as “minimal fizz – maximum gain” and I can’t think of a more accurate description. I use this pen in both Chocolate and Medium Brown for a natural looking brow with reflections in the strands. The nib is surprisingly stiff given its fine look. I’ve never pressed it too hard and accidentally broken the nib. It stays firm and well shaped. The small spooley in the other end of the pen is quite hard and blurs the product down to perfection. Even this product works well with a bit of sweat and humidity. It is smudge-proof; a good thing for me as I tend to scratch my skin when it itches…I know, a bad bad habit! Still, my “brows” won’t get affected. Last, but by no means insignificant are the tools. This is the reason why my brows (although still not being as perfect as my friends, I simply don’t master the technique) are more in line with the rest of my face and makeup. I have said it so many times before: there is no point of owning super advanced makeup and not invest in great tools for precise application. A lot of makeup can be added using fingers but eyebrow products are not part of that category! If I would ever recommend any brushes for creating fantastic eyebrows, I’ll only ever mention ABH. I own two different brushes (three of each so they’re always clean, letting me dip them in the various shades of my powder products). Brush #14: Not available on the Global ABH website I recon it must have been a limited edition brush. However, It is still available here in Dubai! This dual-ended brush was made for the soft Brow pomade, but it works equally well to finish off the look with the powder product. The spooley is soft and designed to brush up the brow and revealing any stray hairs in need of plucking. The angled flat brush is by far the skinniest set of bristles I’ve ever seen. Still, it is firm and design natural looking hair strokes in one effortless move. For someone like me who has awful sparse brows and master equally awful brow-painting skills, this brush is my savour. 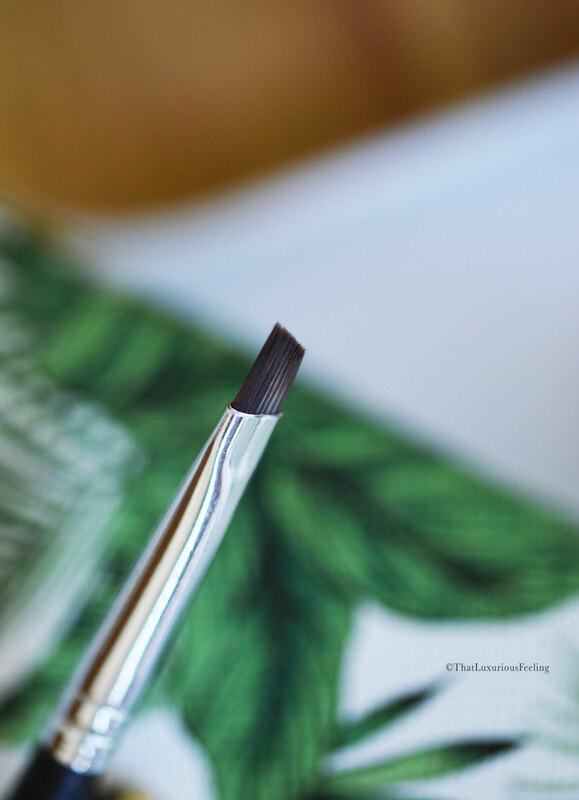 Brush #7B: With its shorter bristles, this ultra-dense angled flat brush is what I use to mark out the brow and start my application with the Duo Brow Powder. I don’t really like the idea of “painting on eyebrows” but let’s face it – that’s what I’m doing and this brush make me stay in control without creating any sharp edges. I’m a bit allergic to caterpillar brows, I want then well groomed but still soft. The fat, short spooley works great to shape and blur the thicker part of the brow. 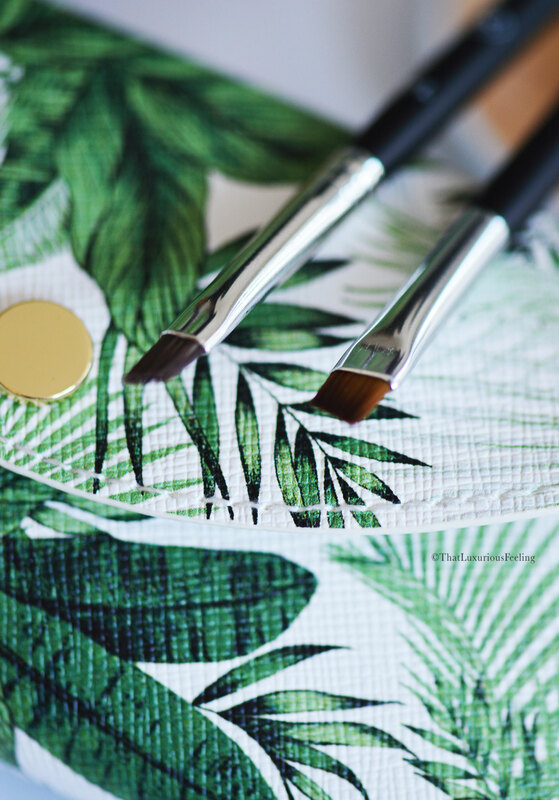 Both brushes are made by synthetic bristles, thus earning them the Cruelty -free sign of approval for those of you who only prefer these kinds of brushes. They are very easy to clean even though the products are water resistant. I use a baby shampoo by Dermalogica to clean all of my brushes except for the Artis range.